Whiteout. After an hour of sun and light wind as we had breakfast, a wall of white approached from the coast and our magnificent scene vanished. 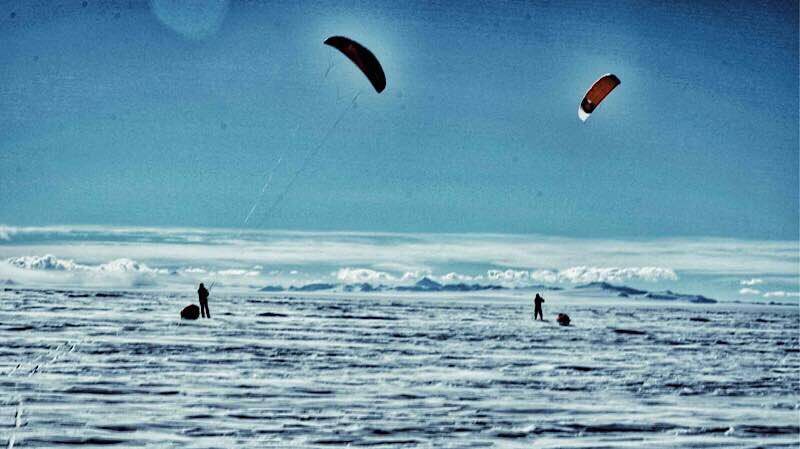 We managed to charge enough camera batteries overnight to be ready to shoot an amazing polar kite sequence. We have a plan and are all set to execute and ride home to glory. But we can’t see anything. At all, like not even the ground. And there is no wind! Looks like she’s not finished with us yet! 90km to go, and we are not going anywhere. The forecast is for a couple of days of this. It has lifted a little and we probably could travel at least some of the way. But we have to go over a mountain col and down the crevassed Henderson glacier to reach Union and for that we will need good visibility. And we’re super keen to try to capture some of the high speed kite magic on film properly, to be able to share with you all what it’s like to be here doing this. It’s awesome, it feels awesome, and we want to make it look as awesome as it is, to give you a feel for it. There is no need to sprint blindly for the finish. A few more days out here, away from the other 7.6 billion humans gives us some time to rest, relax and recover before re-entry into reality. Disappointing but as you say it’s a good opportunity to quietly reflect on your trip before you come and join the rest of us , all 7.6 billion of us. A quiet meditation in that special place is in order. As ever some brilliant photos. And ,yes, as Glenda says, looking forward to a few more days with you. Thanks for the blogs. Sounds like you are not too sorry to have time to relax and recover before you leave for the finish line and the busy world beyond. You have spare days and food and even seem to have shed some clothing layers with the less cold temperatures. 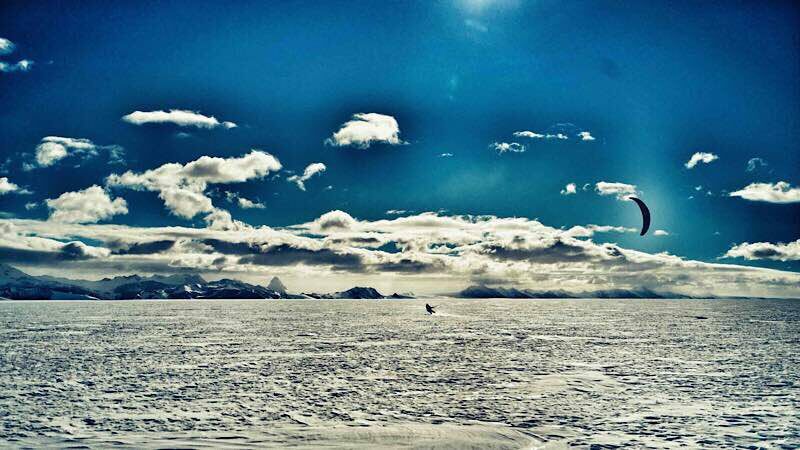 I will miss the daily blogs and feel sad to “leave” the Antarctic environment you have described so well. Goodbye too to the little community of commentators. Look forward to catching up with you Mark back in NZ. Best of luck for your remaining filming sessions………can’t wait to see the result some time! Yep. The more on film the less you need to relate drying your throat. Family awaits though… missing Daddys..
hé oui , c’est ainsi, vous êtes impatiens de retrouver les votre commes nous sommes impatiens de vous retrouver, mais profitez encore un peu de ce rare privilège qui vous est donné de fouler cette partie si belle de la planète…. Didn’t see that one comin’…. almost abit ludicrous in some fashion..
All prepared to express to you guys congratulations and heep praise and adoration.. but not now, not like this.. this pall of dreariness has caused a great discontinuity to the whole episode..
Let us know if we can airlift a few kits containing pipes; smoking jackets and crossword puzzles for your wait on the final push..
You guys really are awesome even when your not making any progress..
With all the comments from friends and family, it feels odd to write although I don’t know any of you personally. But I wouldn’t want your adventure to end without thanking you for sharing your daily ups and downs with us. I loved following you and I am sure many others of the 7.6bn did as well. Enjoy the remaining days – hot showers and beers will become all too common again very soon. You don’t want to come home isn’t it ? 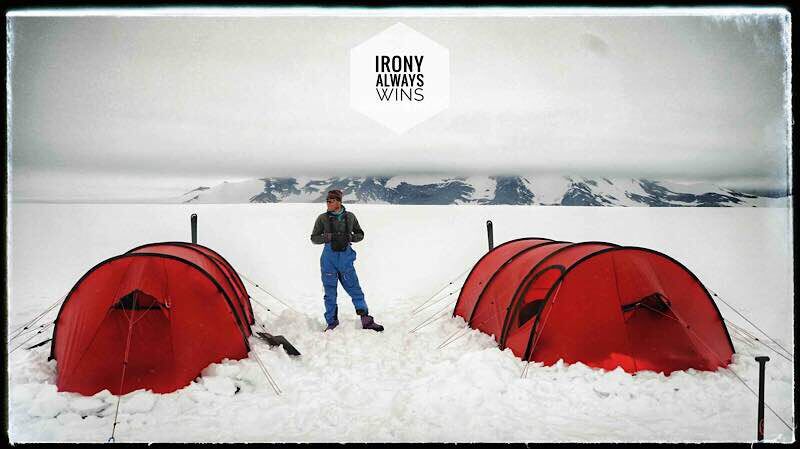 You don’t like the shower’s at Union Glacier ? Are the beer’s to expensive at Union Glacier Bar ? You still have drink’s in your plastic bootles and you prefer finish them before coming home ? We wish you one more day cool wind and soft surface to come home with a big smile. Haven’t heard from Auntie Di for a while! But in all seriousness, there are 522 comments on this blog, and they are the thing that has kept the team writing. They have had copies every day or so, and I know it means a lot to them to know people are following the roller coaster of the adventure they are having. It’s been an amazing part of our morning routine and like everyone else here we’ll miss it. We started out opening this blog each morning with our advent calendar, but in all honesty the small windows of Christmas Lego joy were eclipsed by the snowy adventure and have been far better value for money!!! We’re waiting with baited breath for the safe completion of this adventure now. My Leo is high functioning on the autistic spectrum and doesn’t deal well with transitioning, the end of this experience is quite epic for him, but wouldn’t have missed it for anything, thank you for being so inspiring. Merci de nous avoir fait voyager avec vous tous les jours ! vous êtes fantastiques ! cette année 2018 a bien commencée pour vous, je vous souhaites de vivre encore plein de belles aventures . Encore bonne année e à vous trois et gros bisous Jean .